Click the Below Link to Access the Corrugated Roofing pdf Instructions! 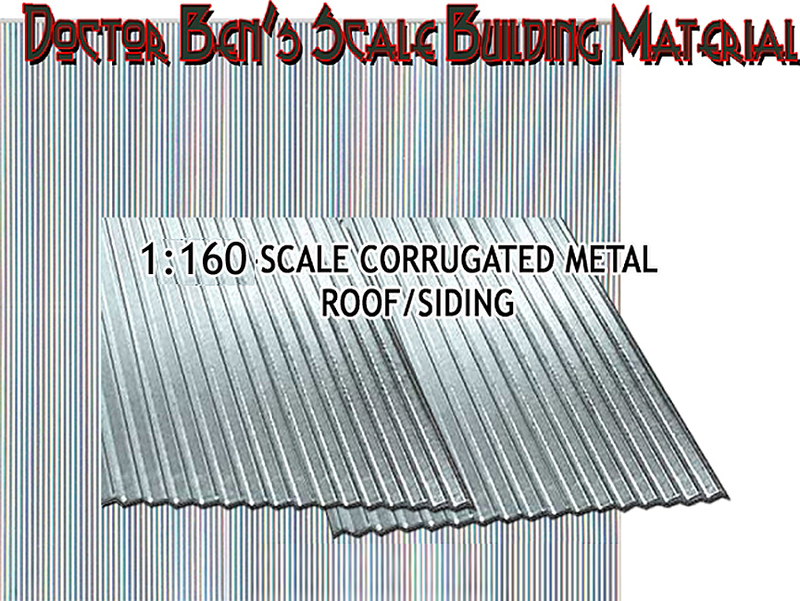 This listing is for ten (10) individual sections/sheets of Corrugated Roofing/Siding Material-Metallic Cardstock (1"x 6") ready to be cut to your size, applied and then weathered. All you have to do is cut to size and glue to your roof! A single section is an N scale 16' Wide and is easily cut to smaller widths with a sharp X-Acto knife. You are going to want to use Doctor Ben's Super Sticky Adhesive #2924 to apply this material to literally any surface. Applying roofing/siding has NEVER been easier. Coloring & Weathering techniques are recommended using Doctor Ben's Weathering & Stain Products! SEE Below! 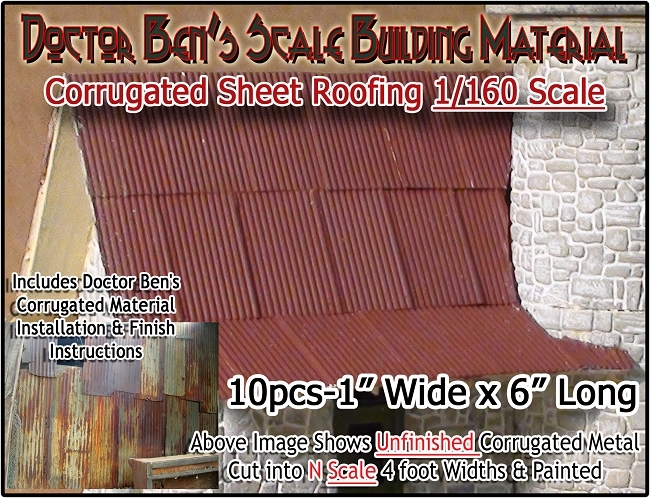 Would you like to download & print out the Doctor Ben's Corrugated Roofing Instructions? CLICK HERE! We want you to be satisfied with your purchase. If you have a question, please ask & we typically will answer very quickly. The image(s) best describes this item & design. Thank you for your business! If you have a question, Just Askkk! CLICK HERE to to Download/Open a pdf of the latest Doctor Ben's Product Catalogue! Our Sincerest Thank You and Appreciation for Your Continued Patronage!! 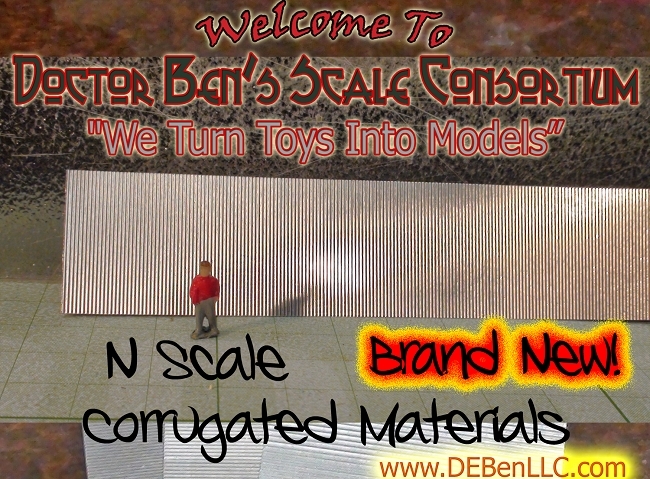 I can safely say that based upon my own positive experiences modeling the *new* Doctor Ben's "Metallic Cardboard" material that my having used this product has changed the reasons that I hated to model corrugated material and now driven my wanting to model it on anything and everything that I can get my hands on! I'm just saying; I love this new product; a lot. WOW! Now Chose Metal and/or Cardstock Corrugated Material!